Home Group & Organization Stories Plays with a purpose — It’s A Wonderful Life! If director Doug Faust and his team at Centenary United Methodist Drama Ministry ever get discouraged doing good, here’s hoping someone will come and show them how much worse off the Mankato area would have been if they hadn’t been around. 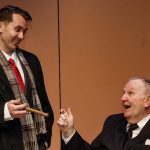 This week, the Drama Ministry is presenting an adaptation of It’s A Wonderful Life with all proceeds going to support Connections Shelter, an ecumenical ministry of several local churches providing shelter for the homeless during winter months. First-time actor, Tim Guetschow plays Harry Bailey in the production and is joined by his sons, Matthias (Tommy Bailey), and Chris (Pete Bailey). Upcoming productions include On Golden Pond in April and Big River in August. Details, including audition times, will be found on the Centenary website and their Facebook page. It’s a Wonderful Life is being performed at Centenary United Methodist Church at the corner of 2nd and Cherry Streets in Mankato at 7:00 p.m. Thursday, December 6th through Saturday, December 8th. An additional performance is being offered Saturday at 2:00 pm. There is no charge, but an offering will be taken. Seating is limited so come early!